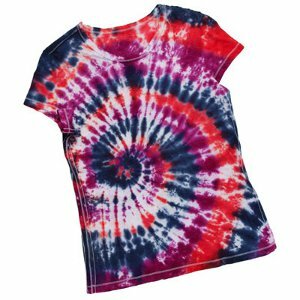 Splash into summer with this unique tie dye design from I Love to Create. Create a bright and fun pattern perfect for the season. It's the perfect idea for tie dying with kids. Prewash T-shirt to remove sizing. Do not use fabric softener or dryer sheets. Cover work surface with Tulip Surface Cover. Lay damp T-shirt on prepared surface. Wearing plastic gloves, add water to Blue, Purple and Red Dye bottles. Replace caps tightly. Shake until dye is dissolved. Decide where on shirt you would like swirl design to start, pinch fabric at this point. Twist fabric around into a flat spiral. Bind with 3 rubber bands, creating 6 wedge shapes. Place tee on paper towel (this will absorb excess dye). Apply dye on wedges using all 3 colors. Flip shirt onto a clean paper towel and repeat on other side. Cover fabric with a Surface Cover. Let sit 6-8 hours or longer for most intense colors. Fully rinse T-shirt in warm water until all extra dye is removed and water runs clear, removing rubber bands. Fill washer to large load setting with hottest water suitable for T-shirt fabric and a small amount of laundry soap. Wash separately the first few washes. Dry in dryer.